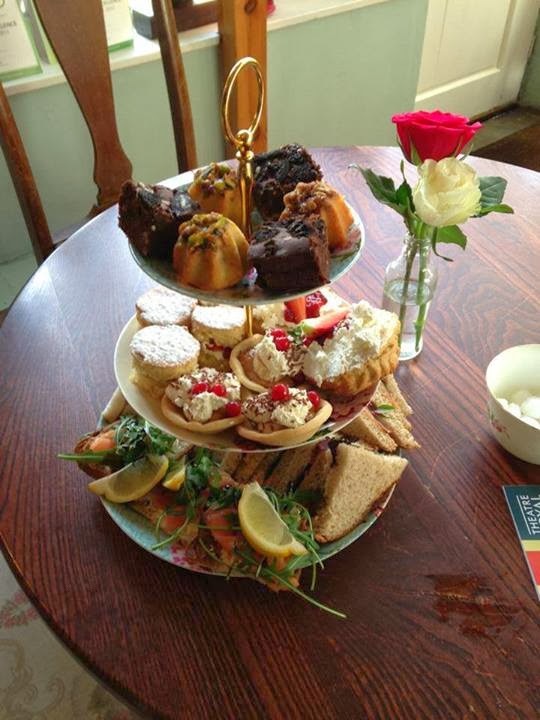 Described by professional reviewers as providing one of Scotland's "definitive" tearoom experiences, the Hidden Lane Tearoom in Glasgow is a cozy and eclectic place offering tasty food, freshly baked desserts and, of course, a wide array of teas. It serves proper afternoon tea with all the requisite scones and sandwiches, but not in a formal or stuffy way. No starched collar required. Rather, it's relaxed and informal. A sign even indicates B.Y.O.B. A tearoom that encourages you to bring your own beer = my kind of tearoom. 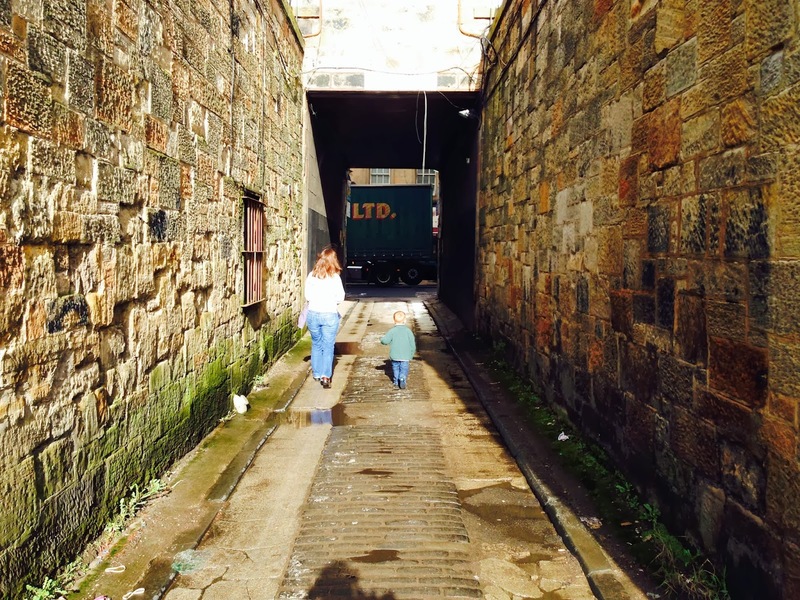 Finding the Hidden Lane Tearoom isn't difficult, so long as you know where to look: down an alleyway off Argyle Street, one of the busy commercial streets in Glasgow's west end. The alley off Argyle Street is to the left of the "G.G. Brothers" liquor store. A chalk sign points the way. The alley emerges onto a cobbled lane lined with indie businesses such as art galleries, boutiques, a used record store, and graphic designers. You emerge onto the cobbled hidden lane. The Hidden Lane Tearoom is at the back left corner. 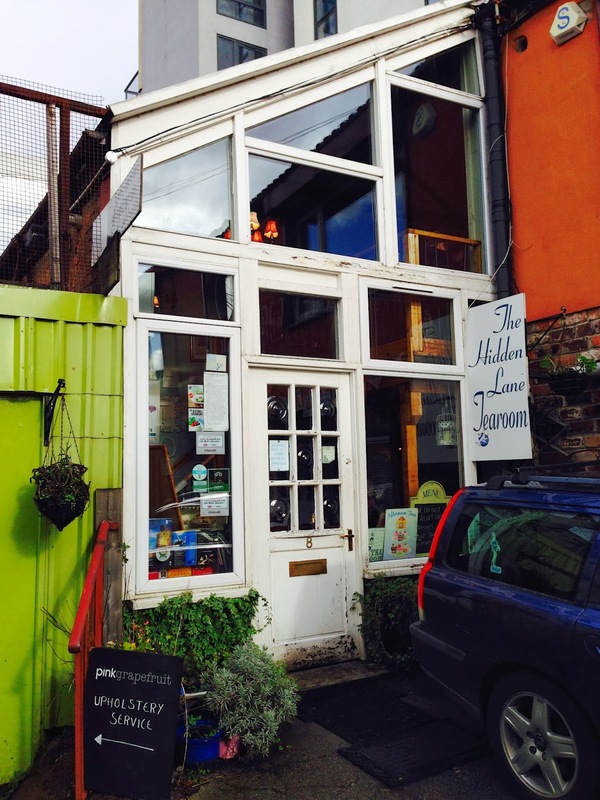 Tucked into the far corner of the lane is the Hidden Lane Tearoom, quaint and bright on a gritty urban street. The expanse of south(ish)-facing windows allows plenty of light into the tearoom. Inside the tearoom it's snug. The small space and the abundant decorations might feel a little cramped, but there's just enough open floor space to avoid claustrophobic worries. The wall of windows helps, too. The view just inside the door of the tearoom. The ground level has front and back rooms for seating; the latter is more of an event room and sometimes closed off. A mezzanine level above lies open to the front room below. Pastel walls are covered in illustrations and photos. As one recent travel article puts it, the tearoom's decorations are on the "just-right-side-of-twee," meaning sweet but not sickeningly so. The view from the mezzanine down to the front room. Vintage and mismatched tea sets decorate the shelves and are used for table service. While some pieces come from auctions and secondhand stores, others have been donated by loyal customers. Tea choices abound, of course -- from Earl Grey to chai to iced teas to nonalcoholic "tea cocktails" -- and the brews are served loose-leaf in teapots, with a strainer. The menu generally offers soups and sandwiches, with daily specials, as well as vegetarian and vegan options. The owner has a passion for baked goods, which figure prominently in the food choices. If you go for a full afternoon tea, you'll get a tower of finger sandwiches, scones, and cakes. Payment is cash only, no credit cards accepted. Our service was friendly and relaxed. Given the small staff and little kitchen, your food likely won't come quickly. The point of a tearoom, however, is leisure and conversation. You shouldn't want your food to come too fast. I don't know that it's hidden, but the tearoom is definitely tucked away. That's part of its cache. Away from the bustle of Argyle Street, patrons can unwind. Idle. Savor a hot cuppa and nibble scones. I'm not a veteran of many tearooms, but this quaint yet modern version appeals to me. We'll be back, I'm sure. I'm sold! Sounds quaint and delicious!